Brighouse Town manager Paul Quinn. 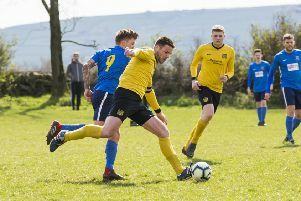 BRIGHOUSE Town Development team centre forward Craig Billington was yesterday undergoing tests in a Durham City hospital after collapsing in Tuesday night’s Doodson League Cup tie at Spennymoor Town. Quinn and Development team manager Charlie Tolley went to Durham Teaching Hospital after the game and found Billington to be conscious and a lot better. “We were told they would be keeping him under observation overnight and he would be undergoing tests the following day,” revealed Quinn. Town travel to Ossett Town on Saturday (3pm) after being rather charitable of late in the league. Ossett, after a dismal October, parted company with long-serving manager John Reed and have put Graham Nicholson in charge. In his first game in charge they draw 1-1 with Kendal Town and then won 2-0 at Goole on Tuesday night in their Doodson League Cup first-round tie. Brighouse’s manager said he would not be playing new signing Mark Betts, owing to the player’s calf problems. “He might be OK for a run out by Monday when we play Harrogate Town in the West Riding County Cup at the Dual Seal Stadium (7.45) but we are better leaving him to get right as he hasn’t played for two months,” said Quinn. Centre forward Betts was in Curzon Ashton’s promotion play-off winning side that went up into the Vanarama National League North at the end of last season and Quinn says he has the nous and skill to do a job at this level. The manager is also confident he will have experienced players Adam Wilson, Sam Hewitt and Ben Thornton back for Saturday after they missed the Trafford game but midfielder Tom Haigh has one game left to serve on a ban. Winger Tom Robinson is sidelined with a strength-sapping illness and is seeing consultants. Should Town beat high-flying National League North side Harrogate Town then they will host Barnoldswick in the next round. Quinn revealed he was fully aware Halifax-based former Everton, Oldham Athletic and Bradford City midfielder George Green was available but didn’t bid for the former England schoolboy, who left Oldham last week and signed for Ossett Albion, Brighouse’s Boxing Day opponents.